Howard Coffin’s private collection of Civil War related artifacts is on display at the American Precision Museum in Windsor through 2014. Titled “Full Duty”, the exhibit is shown in conjunction with “Arming the Union,” the museum’s depiction of the role played by Windsor gunmakers in supplying arms to the Northern armies during the Civil War. Howard Coffin is available to lead tours of his exhibit. Items from the Coffin collection are also on display, in a rotating exhibit, at the Vermont State House’s Cedar Creek Room throughout the Civil War Sesquicentennial, which concludes in 2015. 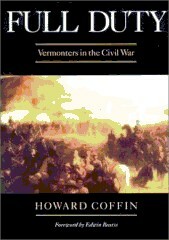 Click here for more information: The Civil War Collection of Howard Coffin.